Sycamore Terrace Apartments expresses its gratitude toward Selena Westling for her loyalty and dedication to always making sure that the community consistently serves its residents with compassion and excellence. Sycamore Terrace Apartments in Temecula has been a facet of success in the community for more than 30 years. A significant element of this newly remodeled apartment community’s success is the commitment of its staff.. One person in particular has worked with Sycamore for about 18 years toward achieving excellence. She has dedicated her time and effort to make this community the best it can be. In 2017, she was selected to receive an award for her diligence and enthusiasm throughout her years of service. Ms. Selena Westling, the Property Manager of Sycamore Terrace Apartments, holding her plaque of recognition for the Trademark Women of Distinction Honors Edition. In 2017, Selena Westling, the Property Manager of Sycamore Terrace Apartments, was chosen for inclusion into the Trademark Women of Distinction Honors Edition. Her years of service at Sycamore Terrace Apartments has made an impact on many people, including the residents and her colleagues. The Trademark Women of Distinction selected Westling due to her compassion and expertise in the apartment rental industry. In 18 years, Westling has facilitated the community through several transitions. Throughout the years, Westling has supported the Sycamore Terrace community through many stages. She is known to be a problem-solver who willingly and kindly assists anyone to the best of her abilities. 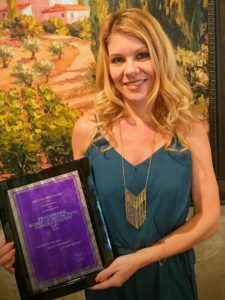 Her attention to detail and vast knowledge of the community and the rental market in Temecula city have helped build the stellar reputation of Sycamore Terrace Apartments in Temecula. In 2017, Sycamore Terrace Apartments maintained an average occupancy rate of 98.5%. These numbers are above average in the rental industry. Westling has been a huge proponent of implementing new and fresh ideas. Her bold leadership makes the community run firmly and smoothly. Sycamore Terrace congratulates Westling for her continued tenacity, honesty, and integrity. We are looking forward to many more years with Westling as our Property Manager! Sycamore Terrace Apartments offers residents in Temecula the best one- and two- bedroom apartments, management services and a taste of the great California lifestyle. The community comes with a host of amenities like spas, pools, a fitness center, children’s playground and more. See for yourself the joy and sense of community that we can offer you. Sign up on our blog to know more and get the latest updates.